Midway through the boys 4A 800 meter run Daniel Maton of Camas (left) was side-by-side with Luke George of Issaquah, then went ahead to win with a comfortable margin at the state 2A, 3A, 4A Track & Field Championships held at Mt. Tahoma High School in Tacoma, May 26, 2018. 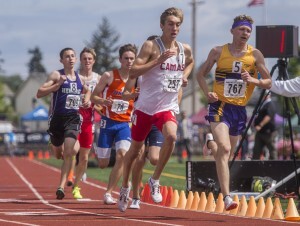 Lincoln Victor, 100, Union; Blake Deringer, 200, Camas; Jack Thomas, 400, Skyview; Ryan Cibart, 800, Heritage; David Connell, 1600, Camas; LJ Floyd, 3200 Camas; Zack Maier, 110H-300H, Skyview; Adres Solorzano-Jones, HJ, Union; Tyrel Halme, PV, Battle Ground; Willie Tran, LJ, Union; Cody Laxson, TJ, Union; Zion Fa’aopega, SP, Union; Victor Naumov, DIS, Union; Jackson Saylor, JAV, Union.